Working remotely has many benefits, beyond just avoiding having to get dressed in the morning. According to a recent survey by AND CO from Fiverr and Remote Year, 62% of remote workers chose their lifestyle so that they could have the freedom and flexibility to work from anywhere. But alongside these benefits come some challenges that are unique to remote working. 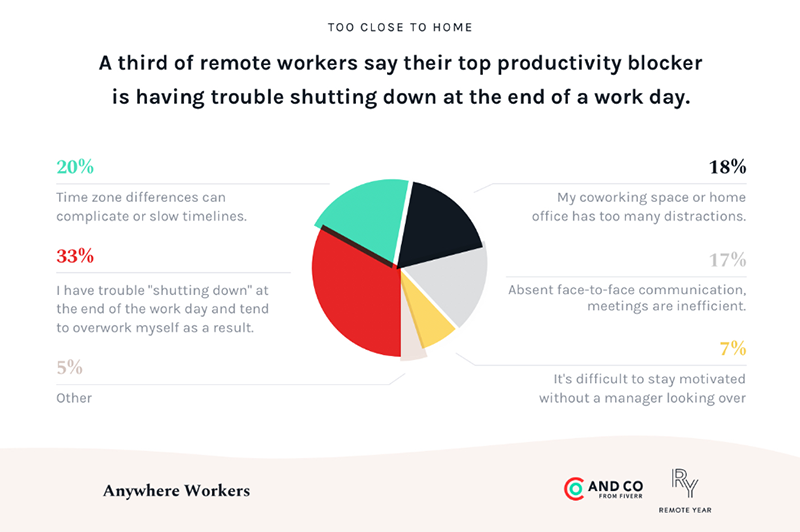 For instance, a third of remote workers have trouble shutting down at the end of the day, and this has an impact on their productivity. 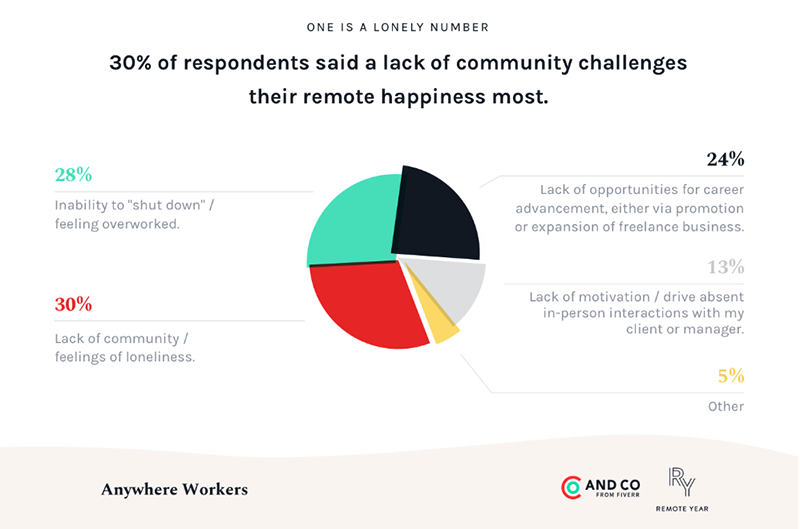 But the number one challenge to the happiness of remote workers is the feeling that they’re lacking community. Without chats around the water cooler and the spontaneous kitchen conversations that lead to new ideas, it’s easy to feel like you’re all alone… which can pretty be demotivating. No matter how much you stay connected via the miraculous internet, it can be tough to feel true connections when you’re working remotely. But it’s not impossible. With a little extra effort on your part, you can build meaningful relationships both with your coworkers and with other remote workers. Real-time communication software like Slack has brought us a long way towards bridging the gap between office-based and remote workers. But it’s easy to fall into the trap of using these strictly for getting stuff done, and it can start to feel like we’re just following up or being followed up all the time—which builds resentment, not community. If you can, open a #random channel on Slack and contribute to it regularly. 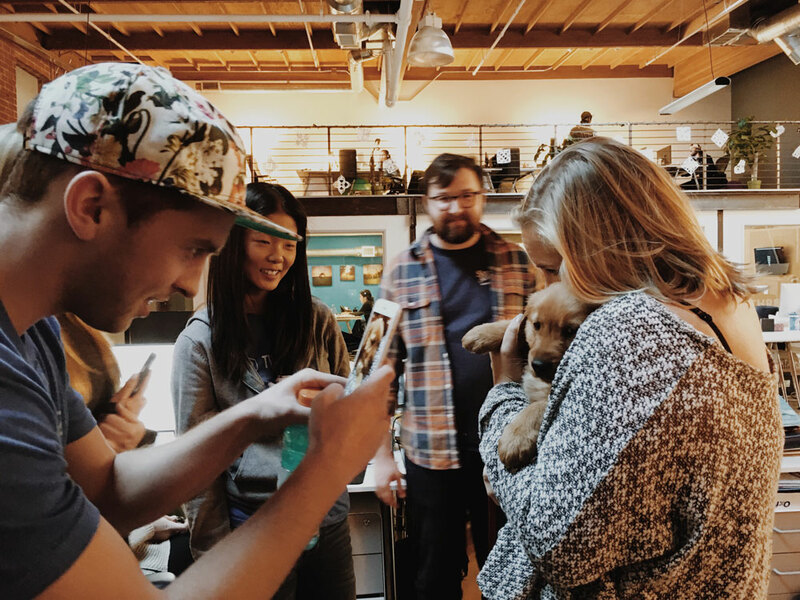 When you see a cool project from outside of your company, a funny cat video, or a relevant meme, share it with your colleagues—just like you would if you were sitting next to someone in an office. More of a music lover? Create a #music channel to do the same. Your team will get a little insight into your personality and you’ll have something to talk about besides your upcoming deadline. Connect regularly with team members who have a role that’s even a little bit connected to yours. Even if you won’t always have something to talk about, set up a recurring meeting invite so you can keep in contact. Use video calls so you get the benefits of face-to-face interaction, like putting faces to the names you see in chats and emails every day. Learning your co-workers’ facial expressions and tone of voice can also help reduce the potential for misunderstandings that can occur with written communication. Another respondent from the Anywhere Workers survey said, “Real-time communication is fine, but after two years of working with some folks remotely, I still feel like I know nothing about them.” Consider incorporating time for personal updates or small talk on each of your calls, so you’re able to build the trust that comes with social relationships. You can use communication tools to share things about yourself too—for example, each employee could regularly share a picture of the view from where they’re working, or an update about what they did on the weekend. As a remote worker, you have the added bonus of being able to connect with fellow remotes—a whole other community outside of your coworkers or clients. And chances are, they know what it’s like to feel a little lonely too, so they’ll be more than happy to make a new friend. And those new remote worker friends you make? One may even have a puppy. There are a huge number of social media communities you can use to get connected to other remote workers. There are Facebook groups for freelancers or remote workers in just about any niche or location, and these are often really active and really useful for getting quick answers to questions about running your business, how to deal with particular challenges, or whether someone wants to meet for a coffee in a particular place. Instagram and Twitter can also be useful for you to connect with fellow remotes—just search for posts with relevant remote hashtags like #remotework, #remotelife or #digitalnomad. There are also regular in-person events you can attend to get your dose of person-to-person contact. Check Meetup.com for events in your area with people in your industry or with other telecommuters. You might find a new buddy who’ll want to work from a cafe with you or someone you can call on for a Friday afternoon beverage. If there’s no event in your area, consider hosting one yourself. If you haven’t tried working from a coworking space yet, give it a go. It’s a great way to meet and get inspired by others, and make yourself a little extra accountable for working all day. You can sign up on a short-term basis if you want to decide if it’s right for you, or even switch spaces regularly so you’re always meeting new potential remote BFFs. If you’re regularly working from a different country, there are also several programs, like Remote Year, that allow you to do this alongside other remote workers. A quick search will bring up results of great cafes, restaurants, or libraries in your area where you’ll have access to good Wi-Fi. Choose to regularly work from somewhere like this and you’ll be surprised how quickly you start to recognize people. Though they might not be working in a similar field to you, even the familiar face of the barista and some friendly small talk can help you feel a bit less alone. There are plenty of ways to create community as a remote worker, both with the clients or colleagues that you work with and with the remote working community as a whole. All it takes is a little effort, and you can have the benefits of working for yourself without the loneliness of working on your own. Are you a remote worker who has found a way to build community? Share your story with us: @InVisionApp.